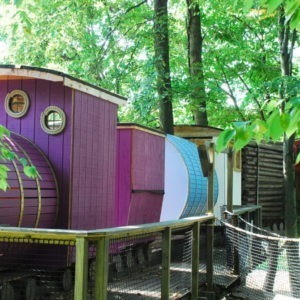 This might be our favorite Treehouse Project ever. 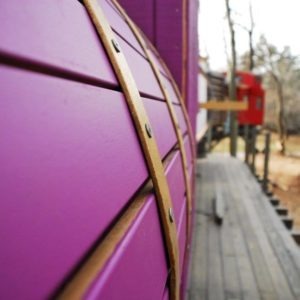 You take treehouses and trains, two of the most popular things with kids of all ages, and put them together in a life sized exhibit that is imaginative and interactive. 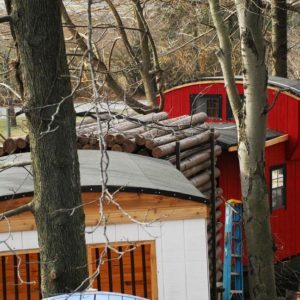 You can visit this project at Treehouse World in West Chester, PA.
We started by coming up with the most popular train car styles and narrowing it down to an example of each. We have an engine with tender (think Thomas the Tank Engine), a water tanker, a circus themed box car, a log car with real logs, and a caboose. 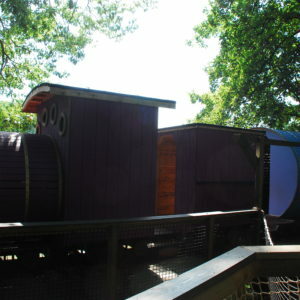 The whole train is 75 feet long and is fully walk through with some areas including walk around deck space with a railing. The train floors are pitched upward at approximately 3 degrees, which is easy to walk on but gives the feeling that the train is climbing a hill (think The Little Engine that Could). We can tweak any car layout, or make larger or smaller exhibits like this anywhere in the country, and other countries too as long as we can obtain work or consulting visas. Some customization is to be expected, since no two tree layouts will be identical. While treehouse costs vary greatly and each project is unique, we understand your need to have some idea what each project in our portfolio would cost to build. Please see our tree house pricing page for a description of the factors that go into each quote. 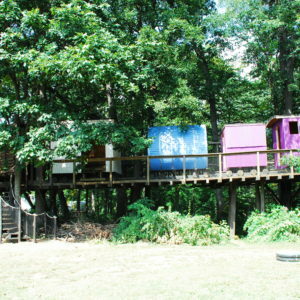 This tree house as shown would cost between $130,000 and $190,000. Please feel free to contact us to discuss whether your project would fall on the high end or low end of this range.